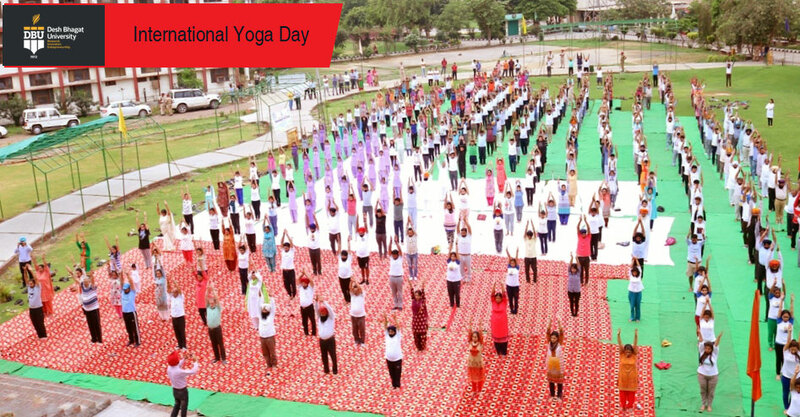 ‘Yoga can transform New Energy, Enthusiasm and Positive thinking in us and our Youth have to adopt Yoga for holistic development of their personalities’, said Desh Bhagat University Chancellor Dr. Zora Singh. He was speaking on the inaugural ceremony of International Day of Yoga organised by the University. The District level programme was organised in collaboration with Ayush Department, Punjab and District Ayurvedic and Unani office, Fatehgarh Sahib. Director Dr. Kulbhushan informed that more than 650 participants attended the early morning session with full enthusiasm. The event was started with the live telecast of PM Narender Modi's Yoga Day Celebration from Lucknow. Yoga Trainer Dr. Jaswant Singh, Dr. Rajan Kaushal( Medical Officer) Dr. Anil Joshi and Dr. Dheer (District Ayurvedic Officer) gave the knowledge of various types of yoga and demonstrated various postures that are beneficial for all age groups. Dr. Poonam Vashist (District Ayurvedic Officer) was special guest on this ocassion who said that said it’s a proud moment for us that today Yoga has attained a new identity all over the world. Dr. Harinder Kaur (Civil Surgeon, Fatehgarh Sahib) graced the occasion as guest of honour said Yoga practice makes us strong internally as well as externally . Earlier, Vice-Chancellor Dr. Virinder Singh while welcoming all the guests and participants said that Yoga is very useful to keep ourselves healthy and stress free in this life of hurry and worry.A large number of students, eminent personalities belonging to different areas participated in it, expressed their happiness saying that Yoga has transformed a new energy in them. The students who have won positions in different categories of Yoga Competition were also honoured. Pro Chancellor Dr. Tajinder Kaur, while proposing vote of thanks exhorted all the people of the country particularly the youth to adopt Yoga as a way of life. 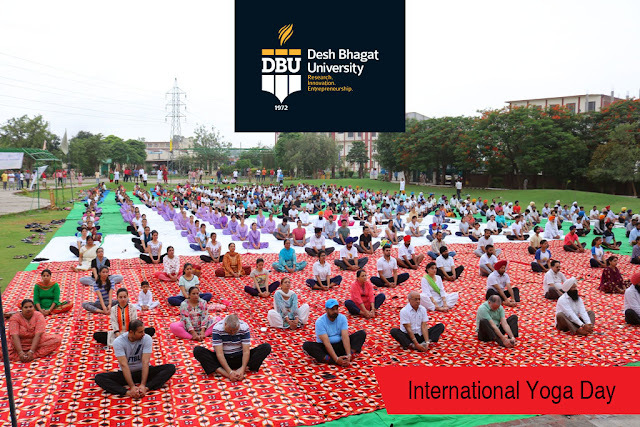 She further declared that Yoga and Meditation will be make compulsory subject for all Desh Bhagat University students. The university offers B.Sc Naturopathy and Yogic Science among other ayurveda courses in India. Desh Bhagat University, Best Private university in Punjab is renowned for its world class academics, quality of learning experience and in particular its widest student diversity in Punjab. The university has been ranked 2nd amongst top private universities in Punjab by MHRD (Ministry of Human Resource Development) Government of India.